of the very few accommodations to stay in style in the area. 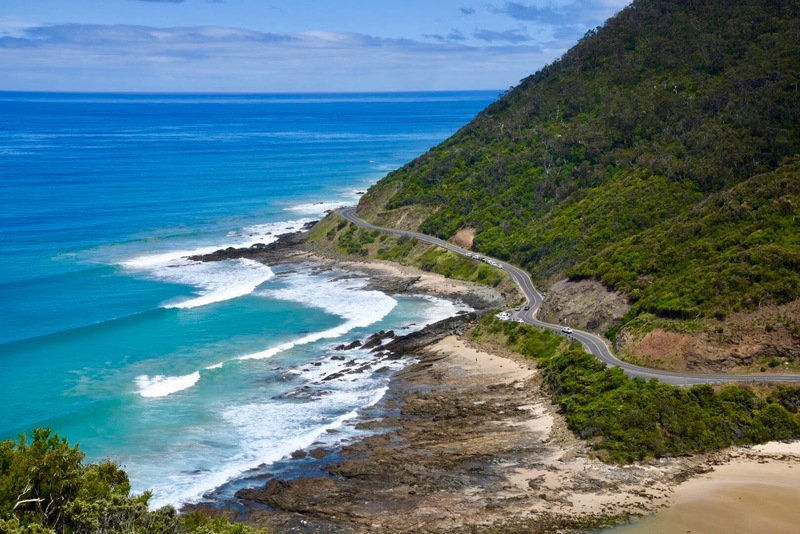 We also drove another part of the Great Ocean Road the following day when heading to Melbourne. 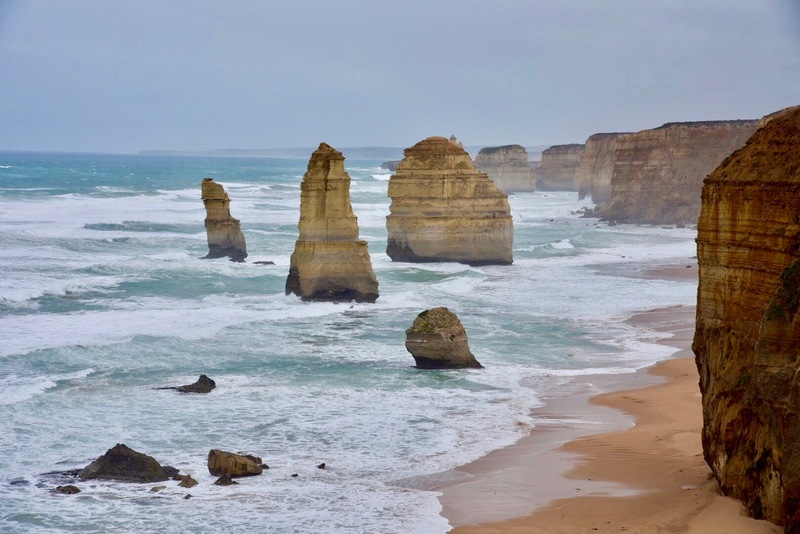 Before going into luxury lodging when exploring the Great Ocean Road, first to what you can expect from one of the best coastal drives in the world. 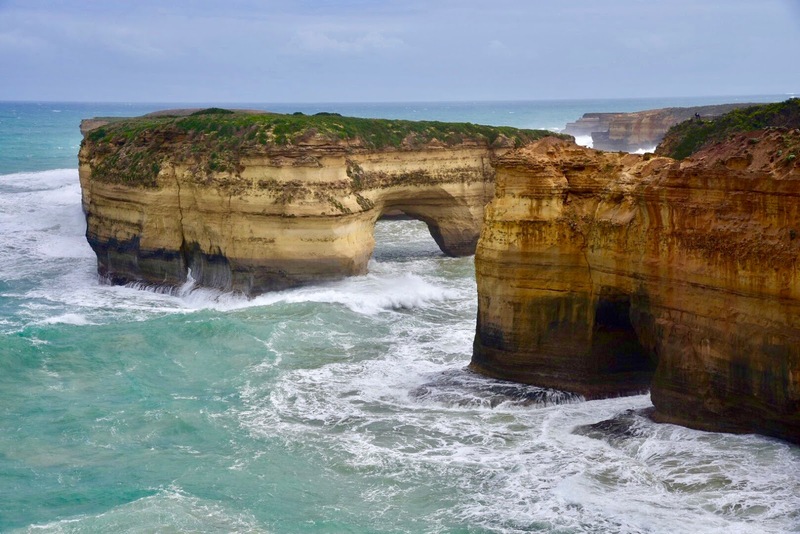 The Great Ocean Road starts in Torquay, a bit more than an hour southwest of Melbourne, and ends in Allansford, near Warrnambool. 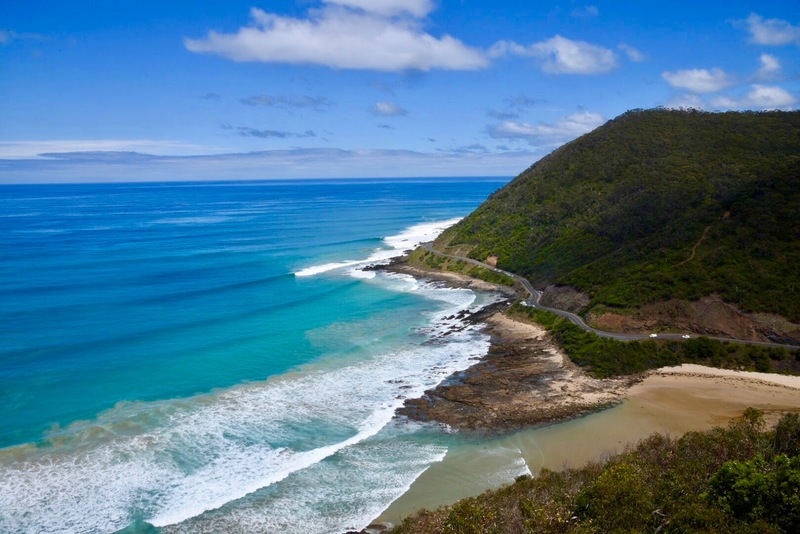 It is 243 kilometers (151 miles) long, listed as Australian National Heritage and gives a myriad of opportunities for sweeping ocean views. 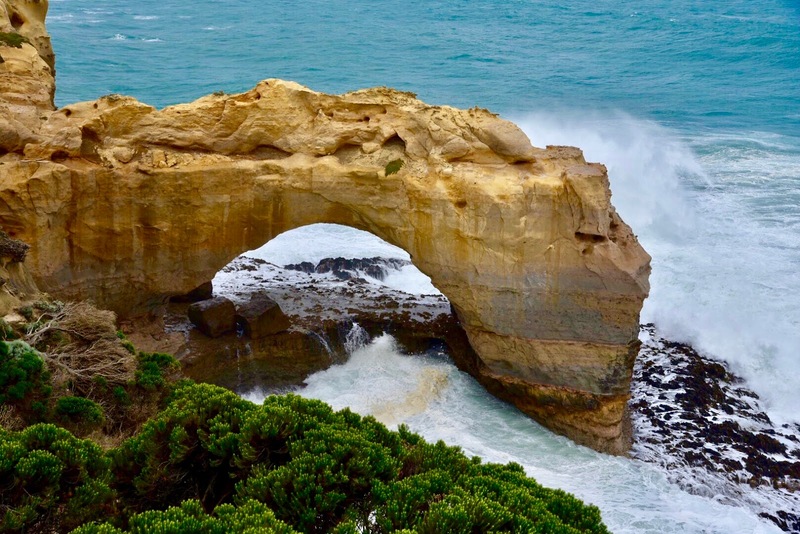 The most famous (and photographed) stretch of road is the one within the limits of the Port Campbell National Park. Coming from the hinterland (The Grampians), we started exploring the fantastic collection of wave-sculpted rock formations from south to north. The first landmark is Gibson Steps Beach, 89 steps lead down the cliff-face to a wild ocean beach. 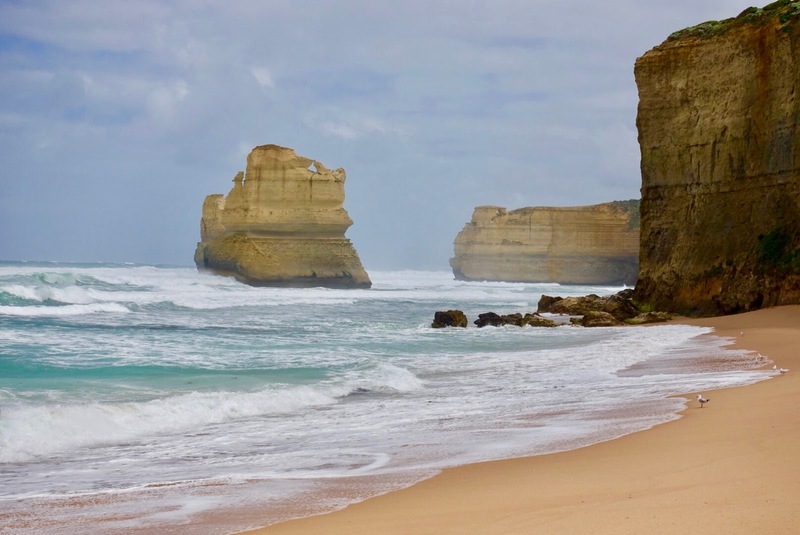 Next is the most popular sight, Twelve Apostles, limestone rock-stacks formed by erosion, though only seven of them are left. 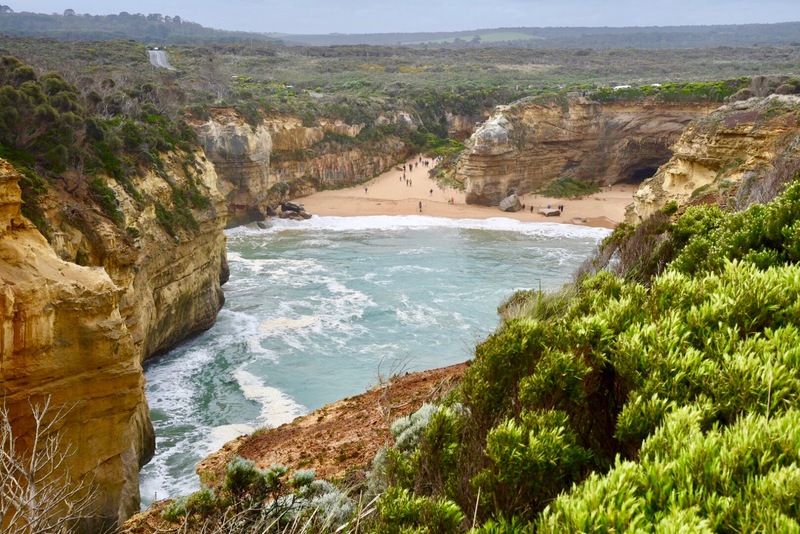 Not far away, Loch Ard Gorge, a spectacular beach inside an impressive gorge, can be viewed. a cave and sinkhole where you can view rock pools carved out in the jagged edged limestone. 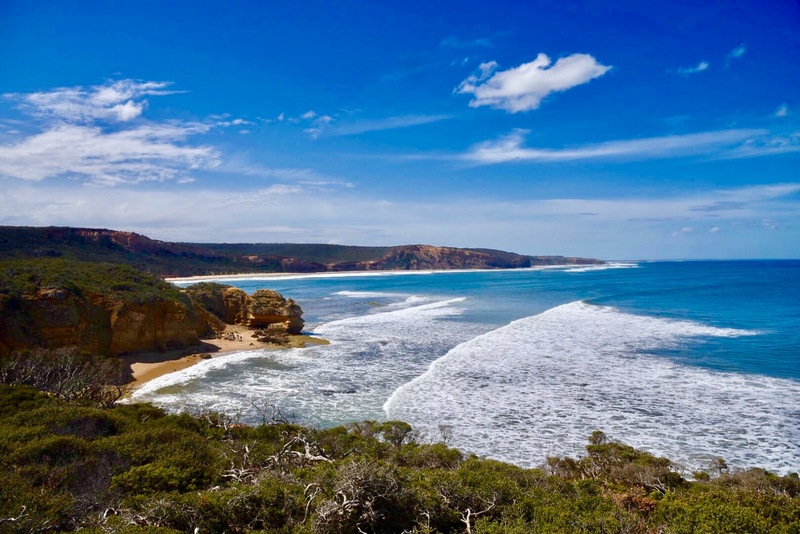 The following day – on our way to Melbourne – we explored another stretch of the Great Ocean Road, this time the one between Lorne and Torquay, which is at the same time the final part of this spectacular coastal drive when driving in the direction of Melbourne. 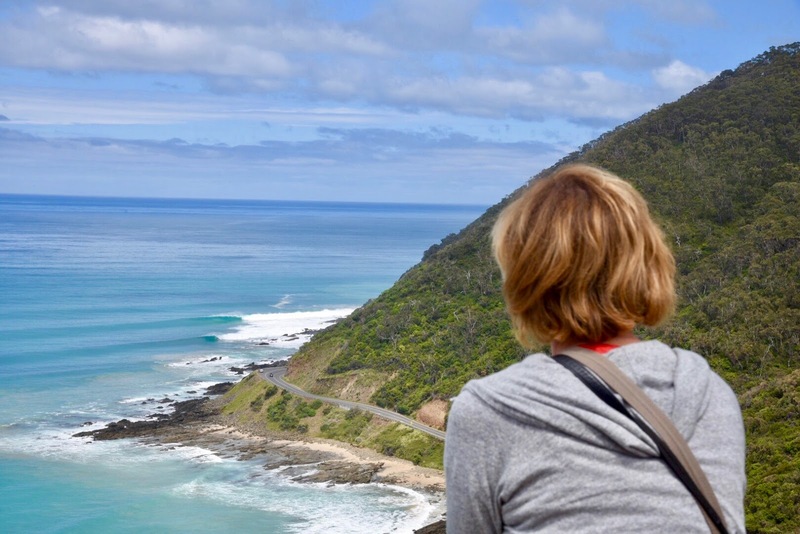 Lorne, a popular summer vacation destination for Melburnians, was our first stop as we were heading to Teddys Lookout for scenic views of the Great Ocean Road, and it did not disappoint! there are equally breathtaking views of the Saint George River winding itself into the valley and of mountainous peaks on the lower one. 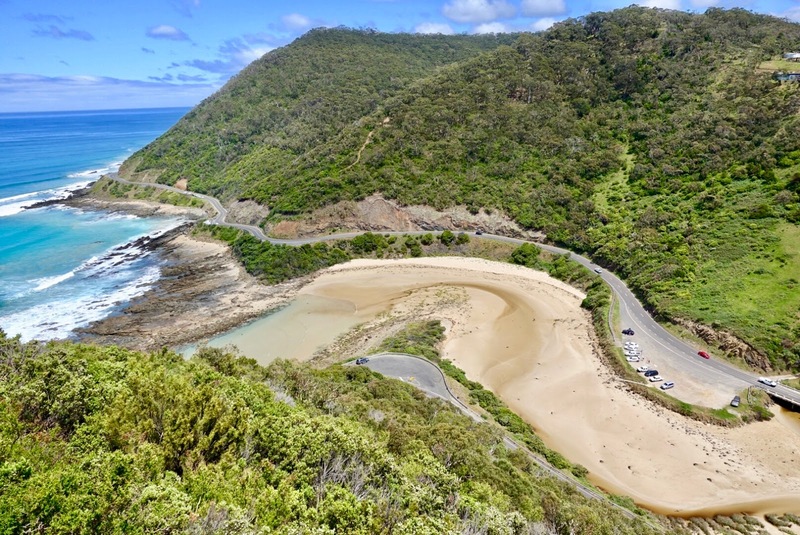 part of the Great Otway National Park stretching form Princetown (from where we started exploring Port Campbell National Park the day before) to Torquay. 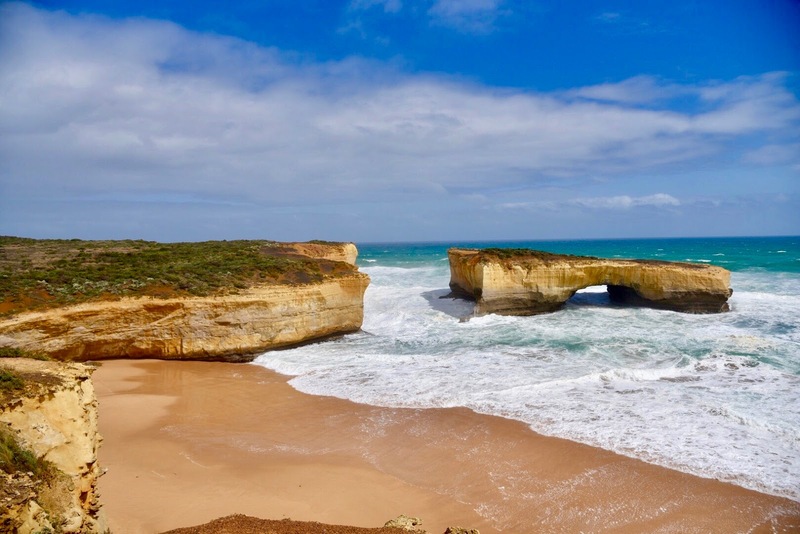 Unfortunately, we did not have time to do this part of the Great Ocean Road, but I am sure it is also worth visiting with rugged coastlines and sandy beaches as well as rainforests and streams. 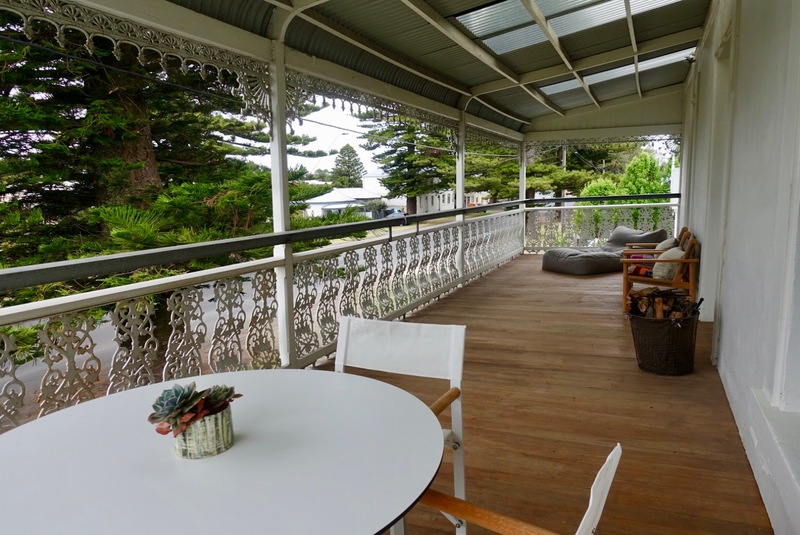 After pointing out some highlights on the Great Ocean Road, I will go into a truly awesome place to stay in style when being in the area. I am afraid that there is not much on offer when it comes to luxury accommodations along the Great Ocean Road. I was so underwhelmed by the lack of lodging opportunities for discerning travelers, that I was even ready to do a detour of almost four hours to be able to stay in style when doing one of the world’s most beautiful drives, although having only one night to spend in the area! That said, it was worthwhile doing as it turned out to be one of the best stays of our Australia trip. 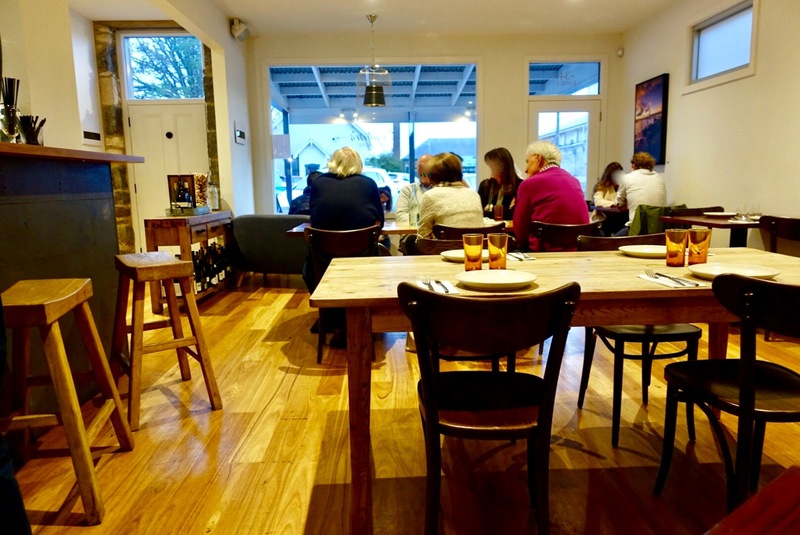 Two things had convinced me in the run-up to our journey that we should give The Drift House, Port Fairy, a try, on the one hand the town’s reputation of being one of the most charming places in the area – more in a minute about it – and on the other hand the prospects of staying in a contemporary luxury accommodation. And off we went, instead of staying near Port Campbell National Park, we drove one hour in the wrong direction (north) to the very end of the Great Ocean Road. 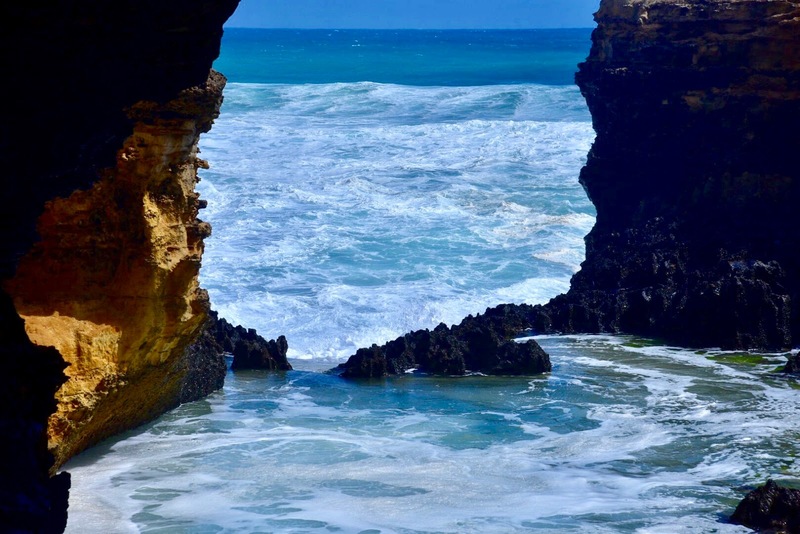 Technically seen, it is not even located at the Great Ocean Road any more. Be it as it may, when we got here, we knew immediately that we were in for a treat! 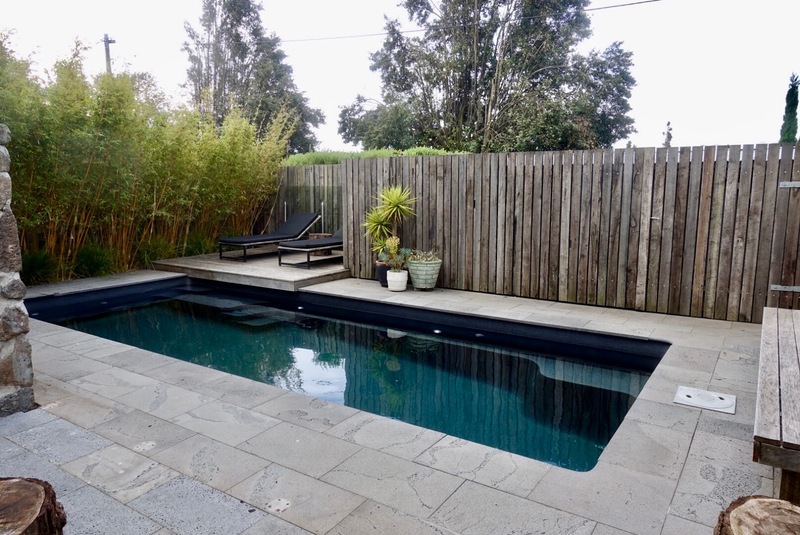 The Drift House is situated on a quiet secondary road into town, centrally located and in walking distance to everything, meaning restaurants, wharf, beach and other natural attractions. The original double story Victorian bluestone house and the neighboring single-story Edwardian villa are complemented by a number of modern extensions. A Melbourne architect studio married old and new in a stylish and original way, a gem of modern design in a heritage context! There are six suites, all exquisitely designed and cutting edge modern, each with its own spirit. 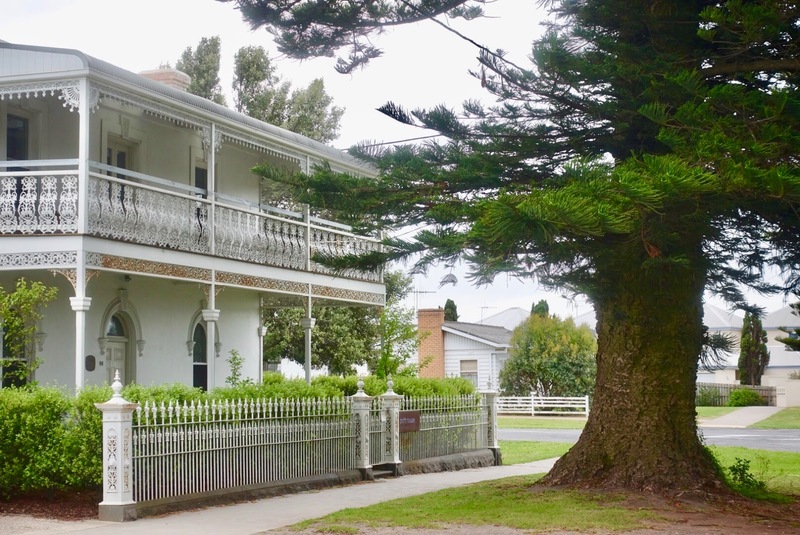 We had Suite #2, in the original property (Victorian bluestone house), on the first floor with a lovely balcony running the length of the house with views to the Moyne River through the town’s heritage-listed Norfolk pines. 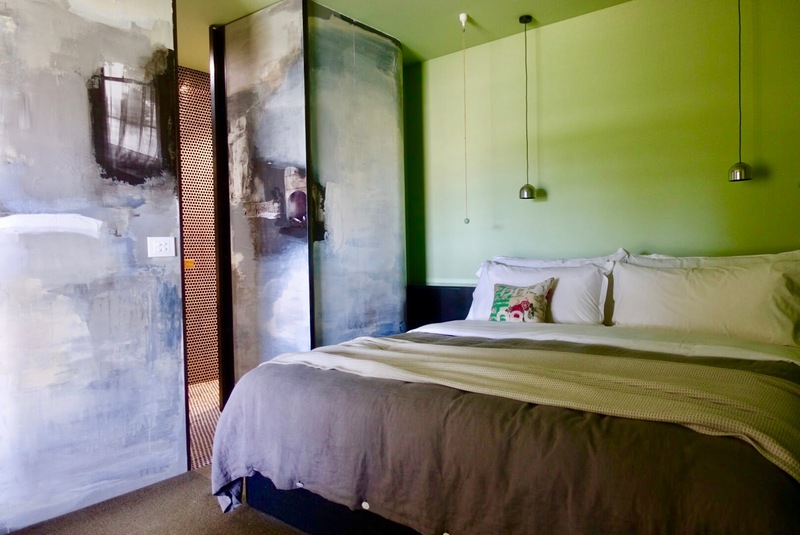 Upon entering, you are faced with an abstract expressionist floor-to-ceiling mural (by Colleen, the owner) wrapped around a bathroom pod separating the living from the sleeping room. high-end textiles and a comfortable bed make the picture of a perfect accommodation for demanding travelers complete. 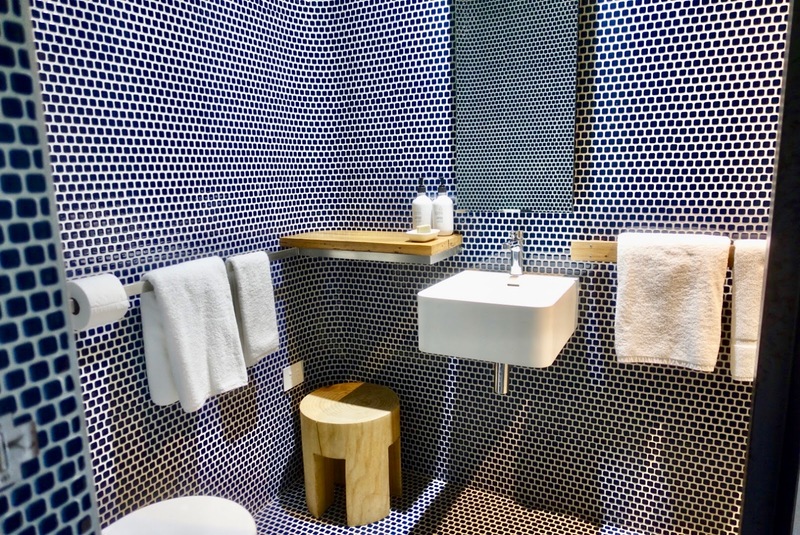 The bathroom is modern with a sizable shower but otherwise – the only (very) minor drawback – a bit on the small side. – we were lucky enough to try out the latter on its first day of service! A continental breakfast is served here, not your usual one but a special treat. 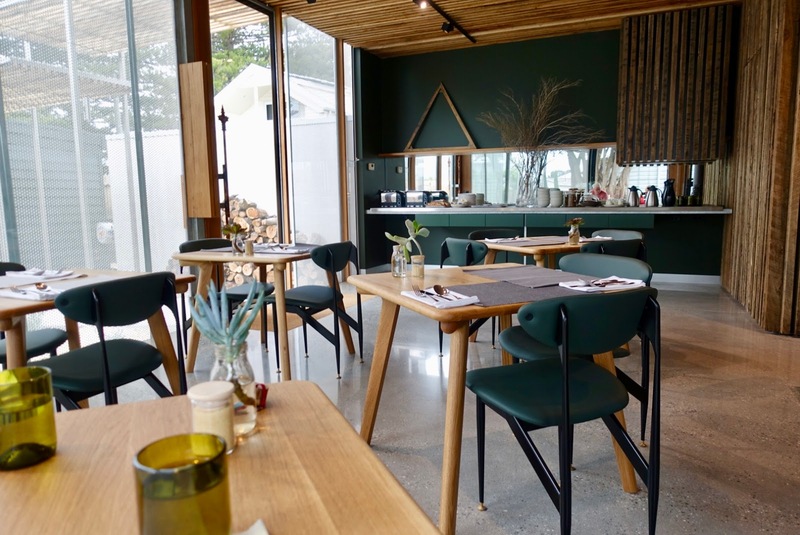 There is a buffet with artisan, locally sourced and mostly organic products: great sourdough breads, a selection of meat, cheese, pickles and fruits, yoghurt and even a breakfast cake! Fabulous, one of the best continental breakfast I ever had! And the owners, Colleen Guiney – I already mentioned her, she is an artist and the creator of most artworks you encounter on the property – and John Watkinson, they are the most perfect hosts, with an intuitive and a heartfelt attitude! 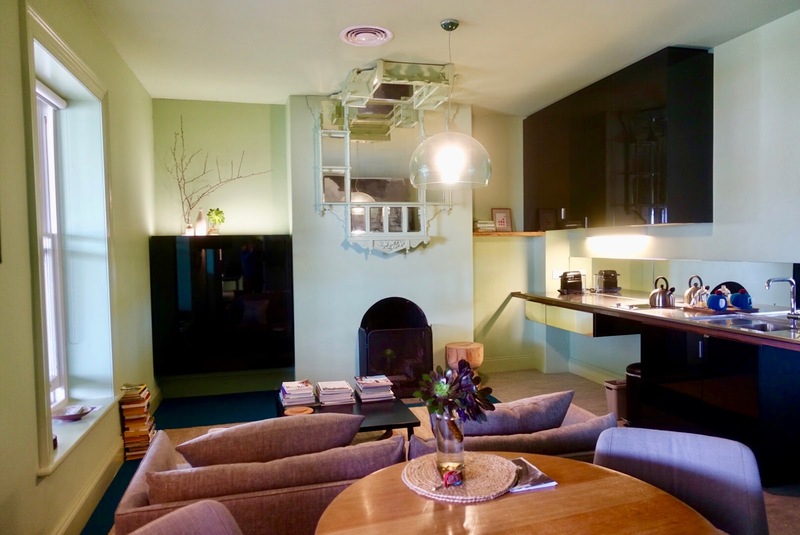 My husband and I immensely liked our stay at The Drift House and would have loved to stay longer, also especially in view of the fact that Port Fairy is not only a jewel but there is a myriad of things to do here! In 2012, this place, one of Victoria’s oldest settlements, populated by sealers, whalers and seamen from the early 19thcentury, was voted the world’s most liveable town, and this in the UN-recognized LivCom Award in the category of towns of population under 20,000. There is a sign declaring it as you drive into town. 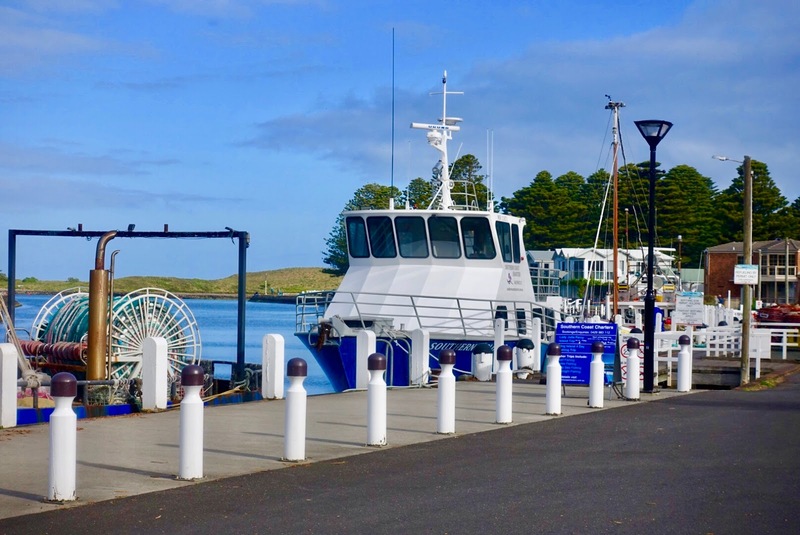 Port Fairy has a gorgeous seaside setting, nearly 300 kilometers (186 miles) southwest of Melbourne, on the eastern headland of Portland Bay. It has plenty of heritage sites, is full of wonderful cafes and boutique-style shops and has numerous natural attractions. There are a many beautiful beaches and picturesque spots along the river. 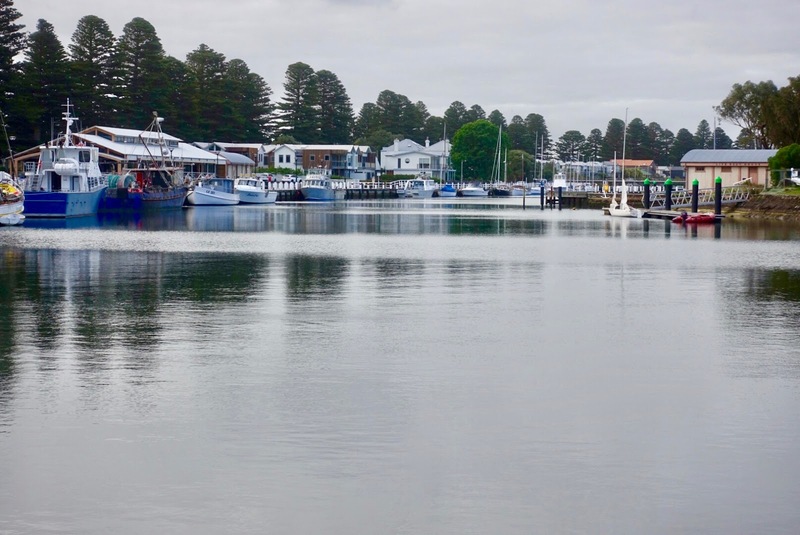 The laidback town has a wharf too, it is nice to stroll around to have a look at one of Victoria’s largest fishing fleets. 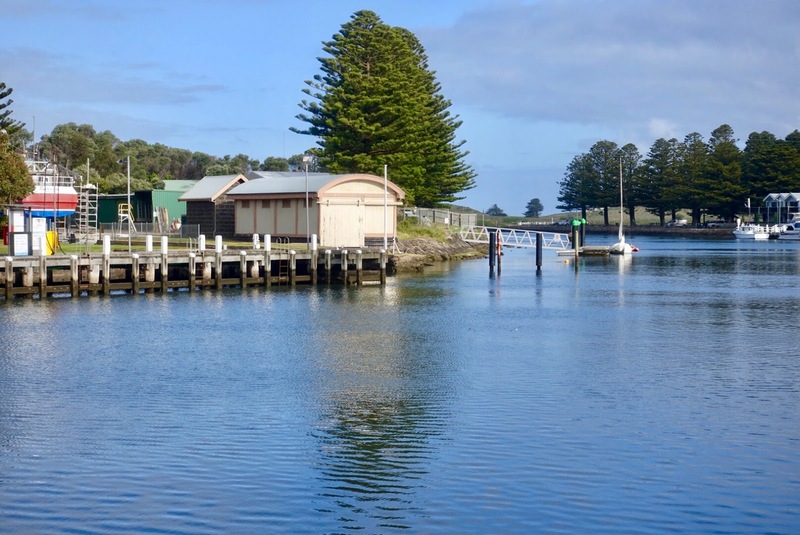 And Port Fairy is also known for its year-round festivals, from which the folk festival is the most popular one. As always when traveling, I checked out walking opportunities on site. From what I hear there are some great walks around the area. Unfortunately, my husband and I run out of time and could not do any of them. 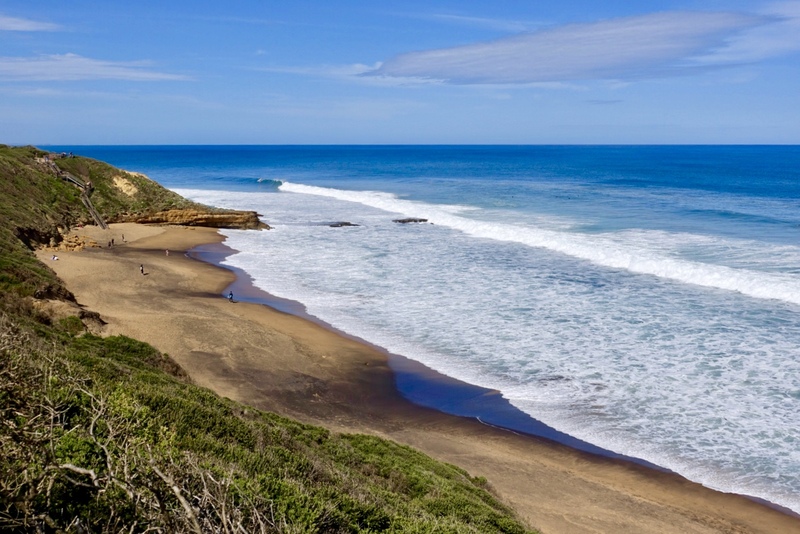 One of the nicest is supposed to be around Griffiths Island – of which we had at least a view from the headland – with its Mutton Bird rookery, its black wallabies and its beach of yellow and black volcanic rock all watched over by a lonesome lighthouse. here in spite of some (minor) imperfections. 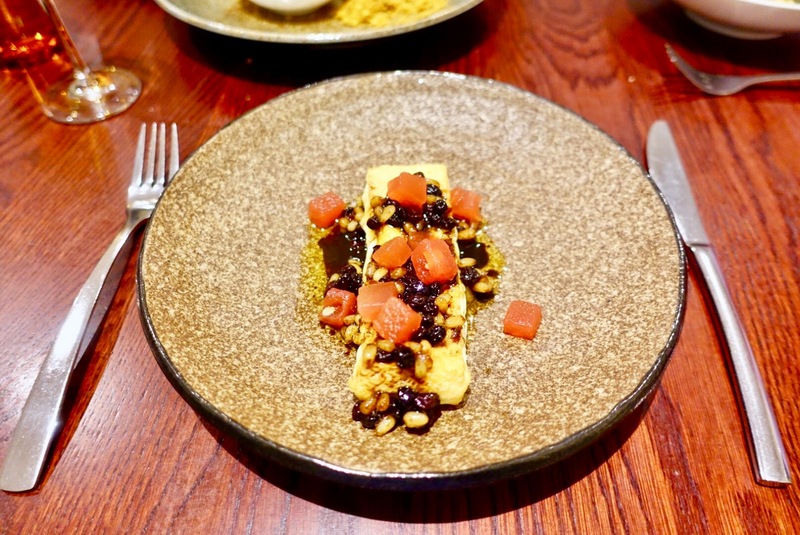 Other places had caught my interest in the run-up of our Australia trip that might be worth visiting – note that I did not try them out –, Coffin Sally for best pizza and cozy bar atmosphere as well as Bank St + Co for quick bites. 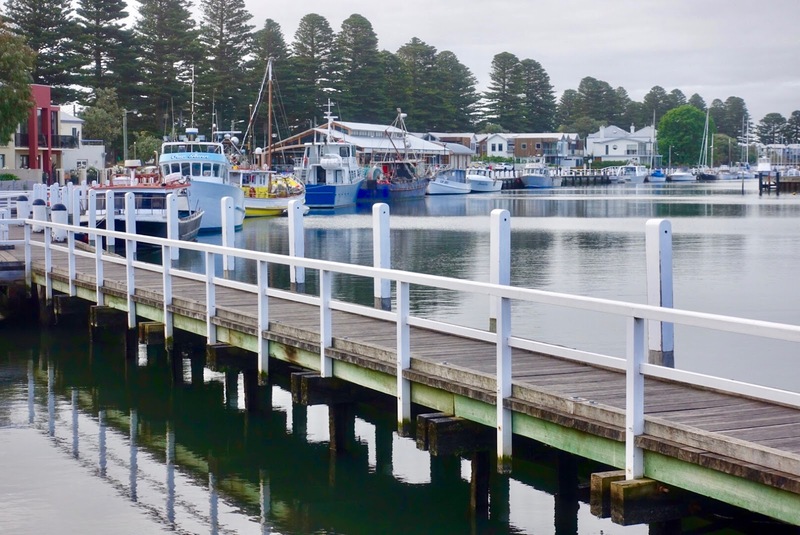 When doing one of the world’s best drives, the Great Ocean Road, and appreciating the finer things in life, then Port Fairy, is a must-do stop! This historic fishing town, nestled at the very end the mentioned drive, has not only expansive beaches and lots of beautiful 19thcentury architecture, but also features one the best boutique accommodations in Victoria, The Drift House. This exquisite high-quality property offers six immaculately designed suites within easy walking distance to everything. And you are treated to a fantastic continental breakfast in the newly built breakfast/lounge area. 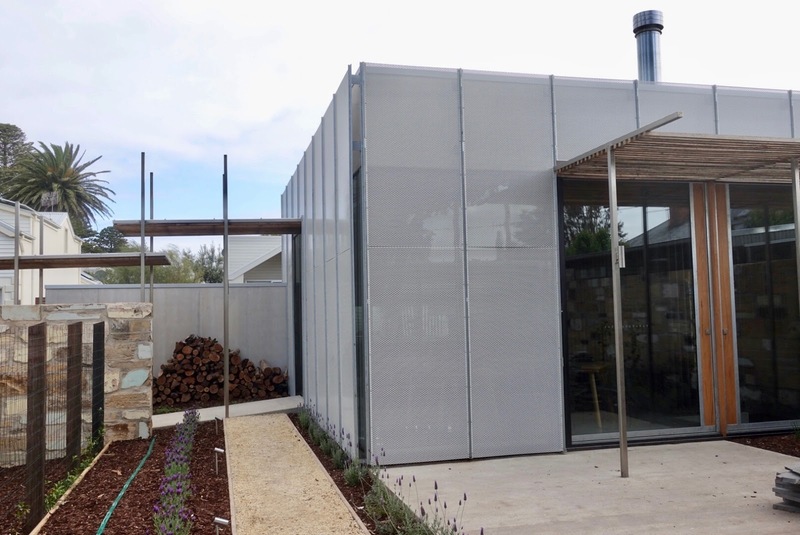 Hands down, our stay at this luxury boutique hotel in combination with its location in a lovely seaside town proved to be one of our most memorable ones on our Australia journey. 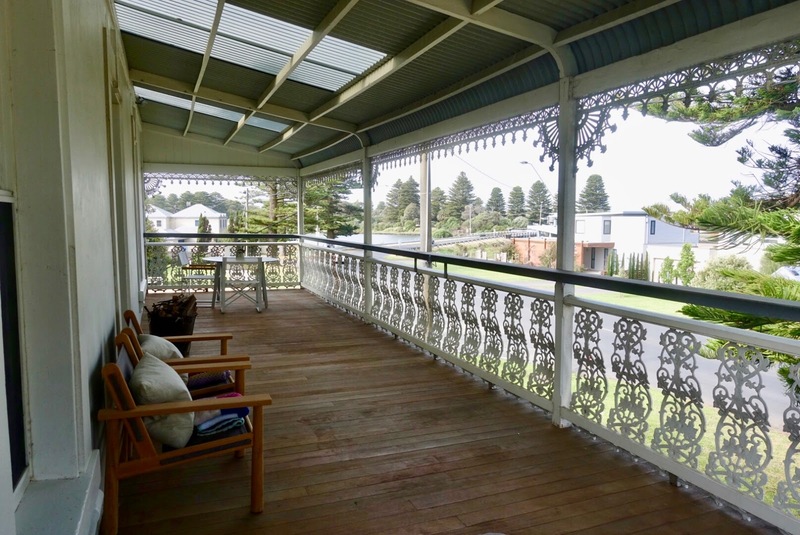 I only wished we had had more than one night here because that is definitely not enough to make full use of Port Fairy’s attractions.